Rising to the challenge set by the Trump administration’s approval of the Keystone XL pipeline, environmental organizations and Indigenous groups are already firing back with a pair of lawsuits and an energized vow to resist the controversial, 1,700-mile conduit. 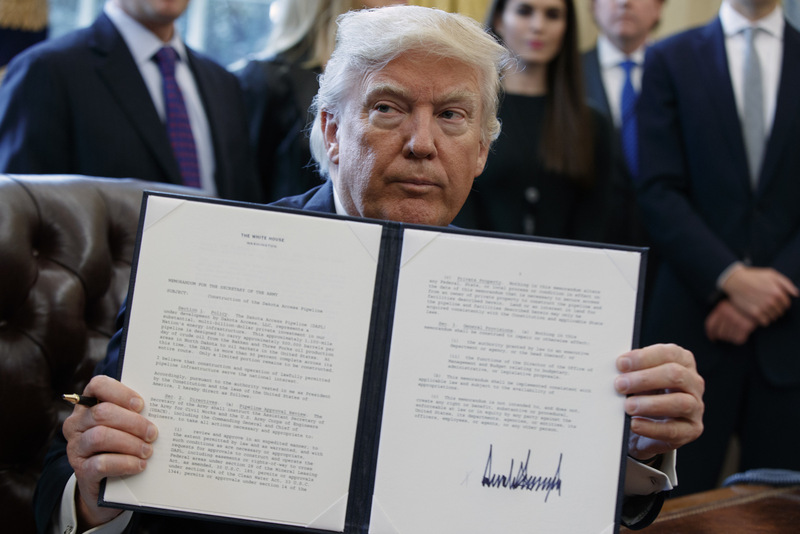 “This dirty pipeline is a loaded gun pointed at our climate and some of America’s most vital water supplies, and we won’t let [President Donald] Trump pull the trigger,” said Kierán Suckling, executive director of the Center for Biological Diversity (CBD), which is part of a coalition of environmental groups that on Thursday filed suit against the Trump administration in the federal district court in Great Falls, Montana. The suit accuses President Donald Trump’s State Department of relying on an “outdated and incomplete environmental impact statement” in its decision making. Further, according to Reuters, the groups argue that “[b]y approving the pipeline without public input and an up-to-date environmental assessment, the administration violated the National Environmental Policy Act.” Plaintiffs also include Northern Plains Resource Council, Bold Alliance, Friends of the Earth, the Natural Resources Defense Council, and the Sierra Club. The lawsuits are just part of a larger strategy to defeat the pipeline. “This project is going to be fought at every turn,” 350.og co-founder Bill McKibben, who was one of the early organizers of anti-KXL protests, told the Atlantic this week. The clearest hurdle is that the state of Nebraska has still not approved a path for Keystone XL. TransCanada, the corporation leading the project, has submitted three different possible routes for the pipeline, but the state’s Public Service Commission has yet to approve any of them. According to activists, more than 100 people have filed to formally intervene against the pipeline’s proposed routes. Further, a divestment campaign and a series of resistance camps along the path of the pipeline, similar to those that sprang up in opposition to the Dakota Access Pipeline, are being planned ahead of next month’s massive climate mobilization, the People’s Climate March in Washington, D.C. on April 29. “We continue to meet Trump in the streets, and we look forward to meeting him in the courts to stop his reckless agenda that threatens our clean air and water and the climate,” said Michael Brune, executive director of the Sierra Club.